With today's growing use of mobile technology, every website needs a mobile page. We design original, readable designs for mobile devices that correspond perfectly with your website. Let us create a site that is designed to be viewed on smaller devices, making it more easily accessible. 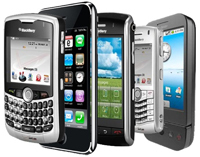 We also optimize mobile websites.